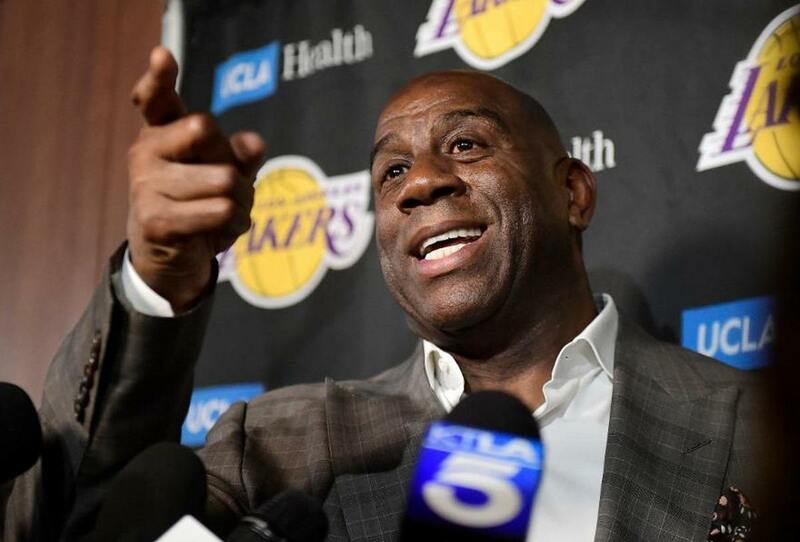 Magic Johnson shocked everyone in the LA Lakers organization, including owner Jeanie Buss and star player LeBron James, when he announced that he was quitting as president of the Lakers during an impromptu press conference. Magic said he didn’t speak to Jeanie first because he knew she would talk him out of quitting. Magic’s disappearing act is just another log tossed into a massive dumpster fire of a season for the LA Lakers. When LeBron James signed with the Lakers he knew he would experience growing pains during the tumultuous rebuilding year, but even King James was not expecting this crazy season would end with the face of the Lakers bailing. Magic Johnson said he wasn’t having fun anymore, which is one of the reasons he stepped aside as president of basketball operations. But Magic was a lot more than a suit, he was the face of the Lakers. His ubiquitous smile has been a part of Los Angeles since the Lakers drafted him in 1979. Magic had the tough task of having to fire Luke Walton, something is very apparent he did not want to do. But this is LeBron’s team now and he wants to install his puppet coach, which will most likely be Ty Lue from his Cleveland days. Magic won a college basketball championship during the 1979 Final Four when he led Michigan State to a victory over Larry Bird and Indiana State. In the pros, Magic won five titles with the LA Lakers during their Showtime era. Who knows if the Lakers could have won more titles if Magic did not contract the HIV virus and had to step away from the game at the peak of his career. Magic Johnson has been a winner his entire career. Whether it’s been basketball or off-the-court dealings as a businessman that includes part-ownership of the LA Dodgers, Magic has always been at the top of his game. To see him quit and walk out on the job on the last day of the season shocked everyone in SoCal, including jaded sportswriters. Everyone knew that things were ugly in LaLa Land, but good times were ahead and were on the verge of picking up. If Magic Johnson is jumping ship, perhaps there’s more problems than everyone was led to believe. One thing is for certain, Magic got screwed during the Anthony Davis talks. Sources close to the team say that he had not been himself since the New Orleans Pelicans betrayed Magic and leaked his trade offers. The leak gutted the Lakers team and they essentially quit on LeBron James and gave up on trying to make the playoffs as the #8 seed. The AD trade that never happened nearly caused the Celtics to implode as well. Magic became a pawn in a Game of Thrones situation. He became collateral damage in an ongoing war between billionaire owners and entitled basketball players. To use a poker analogy, even though he still had some outs and a card to come, Magic folded a hand where he was way behind and new it would take a miracle to win. Ever since LeBron James arrived, the Lakers have done the exact opposite that everyone expected. The Lakers got off to a slow start. Rondo and Chris Paul brawled during the Lakers home debut. Whispers about firing Luke Walton were swirling in the first weeks of the season. Magic assured everyone that Luke Walton would coach the rest of the season. Walton knew his days were numbered. Yet, he soldiered on as a professional and tried to win games. The Lakers beat the Golden State Warriors on Christmas, but they lost LeBron James to a groin injury. He missed more time that he wanted, and the Lakers tumbled out of the playoff hunt. Then it happened. Anthony Davis’ agent Rich Paul, who also reps LeBron James, dropped a bomb. AD wanted out of New Orleans and demanded the Pelicans trade him. Even though AD had 1.5 years remaining on his contract, he requested a trade shortly before the trade deadline. The Pelicans and Boston Celtics expected to trade for AD after the end of the season. However, Paul thought he could expedite a trade to another team. The Pelicans refused to help out LeBron. They stabbed Magic Johnson in the back behind the scenes. The majority of the Lakers discovered that they were on the trading block. They were not worthy of chasing a title with LeBron and the team lost all desire to play. The Lakers quit on LeBron. He suffered the worst loss of his career during an embarrassing blow out. The Pelicans did not trade AD. Alas, the damage had been done. At that point, the Lakers hit rock bottom. The upside was the future. Certainly Magic Johnson would work his magic to attract a top free agent to play along side LBJ, such as Kawhi Leonard and Klay Thompson. Futhermore, LeBron expressed his desire to play with AD. But then Magic bailed. He quit without telling LeBron, the GM Rob Pelinka, or the owner Jeanie Buss. Magic can return to doing what he loves best: being Magic Johnson. The Lakers finished the season with a 37-45 record. They were bad, but not bad enough to secure a lottery pick. quality pick. Meanwhile, intercity rivals the LA Clippers snuck into the NBA playoffs as the #8 seed.